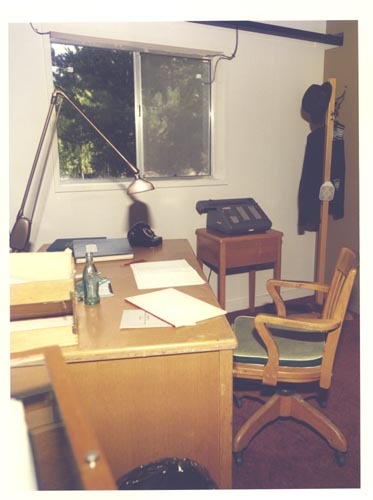 Color image of an exhibit showing a 1950's programmer's desk. It has a dial telephone, a swivel chair, a swivel clamp on desk lamp, in-out trays, a coke bottle sliderule and some papers and manuals. A waste basket is to side of desk. A Frieden calculator it on the right on a small table. A coat rack is in far corner with a hat and coat. A fly swatter is hanging on rack.